The word Aureum in Latin has three different meanings. The first one refers to the golden color. The second one comes from Aura, which means soul and the last one is related to the world Aureo, a number which has always been connected with the pursuit of perfection. Scientists, mathematicians, architects such as Gaudí, used it to achieve the magnificence of their works. This Aureo number has always been represented in spiral form, thus being the source of inspiration for the label. 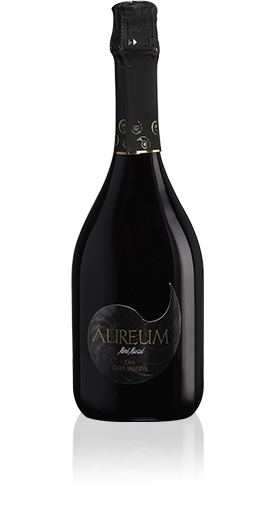 This cava is the expression of the three meanings included in its name: the golden color, the perfection in its nuances and the soul of the people who have contributed to its elaboration. Colour: Bright pale yellow with perfect bubbles in terms of size and their flow. The mousse is full and persistent. Bouquet: Clear notes of dried apricots, ripe fruit (peach and grapefruit), brioche and vanilla. Palate: Fresh, with a creamy presence on the palate, very pleasing and persistent. The palate is endless, enjoy it. Selection of the best parcels of vines, the varieties are vinified separately. Gentle pneumatic pressing, the first musts are selected. Chardonnay is fermented in French barrels, the varietal wines undergo Battonage on the fine lees for 6 months. Blending of the different grape varieties to get the best wine for the second fermentation in the bottle.